The #6 Seward County Lady Saints continued their magical run to begin the 2016-2017 season Wednesday night on the road at Independence, defeating the Pirates 86-69 for their first win against Indy since 2006. 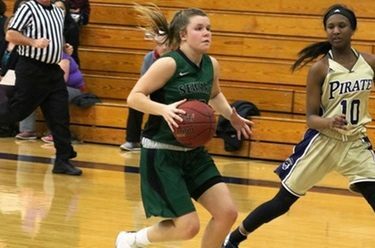 It was a long bus ride for the Lady Saints on Tuesday to Independence, but they didn’t miss a beat Wednesday night to get things going as Seward jumped out to a 7-3 lead, forcing four Indy turnovers in the opening moments of the contest. The Pirates went on their run, taking their first lead of the game at 12-11 and both teams continued to make it rain from the outside in the final five minutes of the first until Independence held a 24-21 lead at the end of one. Things didn’t slow down in the second quarter as a barrage of threes allowed Seward to retake a 32-30 lead just two minutes into the period. Red hot Erin Richardson drilled her fourth three of the half, stretching the Seward lead to 40-32 with 3:23 left and at the break the Lady Saints had opened up a 12 point lead at 47-35. The Lady Saints shot 54% in the first half, getting 16 from Richardson and another 11 from Mollie Mounsey. The scoreboard continued to get a workout as the second half began with the teams trading buckets to a 59-50 Seward lead. The Lady Saints scored the final seven points of the quarter however, pushing their lead back to double digits at 66-50 after three. Independence just couldn’t slow Seward down and the Lady Saints held a sizeable lead throughout the fourth quarter until Richardson put the final nail in the Pirates coffin with 2:50 remaining as the Seward lead grew to 17. That was the way it would finish as the Lady Saints put the finishing touches on an 86-69 win to pick up their 14th win in as many tries on the year. Richardson and Mounsey led the Lady Saints push from the outside as each sharpshooter finished with 21 points while Joanna Grymek did Seward’s damage in the paint as she finished with 19 points and 9 rebounds on 9 of 10 shooting on the night. Reigning Jayhawk Conference Player of the Week Neidy Ocuane had another well rounded game for Seward as well, finishing up with 10 points, 8 assists, and 6 steals in the win. Seward improves to 14-0 on the year with the victory, while also upping their Jayhawk Conference mark to 10-0 to mark the 22nd straight season of double digit conference wins for the Lady Saints. Independence falls back a game under .500 at 6-7 overall and is now 3-7 in league action. Next up for the Lady Saints is a return home to the Greenhouse on Saturday when they will take on Colby in a 6:00 tip on Hall of Fame Night in Liberal. Free tickets are available courtesy of our buyout sponsor Sharp, McQueen, PA at their Liberal offices or at Hutch’s, Toot n Totem, and Community Bank in Liberal.